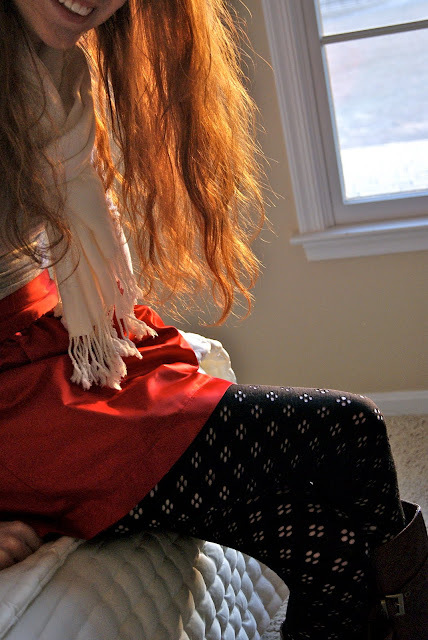 This red skirt just pops among the gray, white, and black. Why are you so darn gorgeous!? You are such a talented girl - I love art, and I appreciate all different sorts of art. You've got an art with fashion, too! I drool over your clothes. ;) You are such an amazing, lovely, sweet, kind and all-round beautiful girl, with so much to give the world. Your art is just one of those many things. I know it's kind of a big deal to show people your artwork, so thank you so much for letting us in on what you do! I love the outfit today, I think I have that same skirt, if it's from American Apparel! wow you are so talented lovie, i love all your art amazing! loved watching this video :] and you are so cute and so gorgeous, and i love your style. I LOVE YOUR ART! Seriously amazing, especially the I <3 NY piece. You are adorable as well :) Great video. I would love to see more. omg i absolutely love you. you are so cute and your art is fantastic! Oh, Emily. you are exquisite! If I didn't think you were fantastic enough as it is, we also have the same sketch book. GO WINDPOWER! Your blog is cute too, I just randomly stumbled upon it now. You're great at art too! Audrey forever! get back to me! I just *have* to draw you and your hair! my internet isn't cooperating so i can't see your vid, boo! but your outfit is presh, i love that scarf! i adore you, too. and your art. amazing, girl. You are such an incredibly talented artist in every sense of the word, from your fashion sense to the work in your sketchbook. ....And if you do end up putting Edward in that frame, I definitely want to see/drool over the final product of his gorgeousness! Emily you need to open an Etsy shop and start selling your illustrations - they are A-MA-ZING!! I would totally buy the New York City and Audrey ones...I imagine I'll be dreaming of both of them tonight!